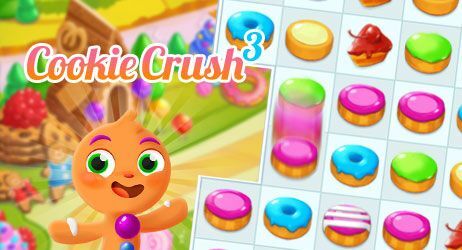 You can explore an enchanted land that’s sugary sweet in this match 3 puzzle game. Link together the doughnuts, pie, and more while you try to crush all the cookies. Sit back and relax as you play a nice game of solitaire in Fairway Solitaire on your browser. The graphics are beautiful and the game is just as fun. You don’t have much time to match up all the squares within this cube. Take a quick look at the mysterious symbols on each one in this 3D version of Mahjong. Can you connect them all before the clock runs down to zero? Prepare yourself for a series of challenges in this unique puzzle game. Fill up the playing board with the colored bricks and find out how quickly you can make them disappear. You can explore lots of famous places or the entire world in this challenging puzzle game that will really test your knowledge of geography. Have a look at each one of these photos from Google Maps. Can you guess where they were taken? Line up the fruits and make your juice. But mind your plums! Have you got what it takes to become a wealthy tycoon? It’s time to show off your business skills. You can select different themes that will really test your vocabulary skills in this crossword puzzle game. Will you be able to correctly answer all of the questions though? These charming gnomes are trying to clean up some gardens located all across their enchanted kingdom. They could really use your help in this magical match 3 puzzle game. Can you lend them a hand while they use boosters and their puzzle skills to link together fruit, flowers, and more? In this science fiction adventure thriller you awake in a strange vat in a disturbing laboratory. Who are you? What's going on? Can you escape the lab in this atmospheric puzzle game? Find the hidden rooms and objects and try to solve this mysterious puzzle! Back in the big house! Can you escape prison again in this gripping tale of stealth, cunning and avoiding extremely short sighted guards? The Tetris® game is a deceptively simple, completely addictive puzzle game. In Tetris® Twist, you'll puzzle your way through different cities. Discover new, fun ways to play Tetris® with a twist, or play Marathon Mode to experience the traditional gameplay. Welcome to your new farm! Can you keep it growing with produce and sell it for profit? Have fun with farm rush! Are you ready for an exciting challenge? Can you find all of the hidden words in each one of the puzzles in this online game? The clock is ticking so you’ll need to move fast! How many of these Google queries can you fill in while you play this quiz game inspired by the famous game show Family Feud? Test your knowledge of culture, famous people, and more while you try to avoid getting three strikes. Join players from around the world in this weird and wild online game. Can you figure out the secret word or phrase that will be drawn during each round? You can join in the fun by drawing one too. Adam is really in a tight spot this time! He’s currently dangling off the side of a cliff while clinging to the tail of a triceratops! Can you help the crafty cavemen get out of this and other jurassic jams in this point and click puzzle game? You can explore caves, jungles, and even his neighbor’s house in his latest adventure with his beloved Eve. Everything’s going back to black in this tricky puzzle game. Can you turn all the stuff in each level into darkness that’s as black as moonlight on a moonless night? Find out if you can discover the solution to the challenging scenario in each dimly-lit level. How long can you keep going in this intense math and puzzle game? Try to squeeze as many of these numbered blocks into the grid as you can while they slowly add up to 2,048. Once you run out of space, it’ll be game over! Can you quickly figure out each one of these hidden words? Put your vocabulary skills to the test in this intense online game. The hanging man is depending on you to save him from the gallows! How many of these famous superheroes can you identify? Have a look at the letters on the board and see if you can piece their names together in this amazing, spectacular, and friendly neighborhood quiz game. You can really give your memory and observational skills a workout in this puzzle game. Will you be able to beat the clock and accomplish other goals in each one of its exciting challenges? This daring adventurer is lost in a mysterious forest. Can you help him choose the correct path that will allow him to return home? He’ll need to make wise choices in order to stay safe in this puzzle game. How fast can you form all of the words that are waiting for you in this challenging online game? Take a quick look at the letters on each one of the boards. Can you piece them together quickly and earn tons of stars? Can you put together each one of these adorable jigsaw puzzles? They all feature a picture of a cute and super strong lion. You can even decide how many pieces you’ll need to use in this delightful puzzle game. How long can you keep merging these delicious cupcakes together? The board is filling up fast in this challenging puzzle game. It’s going to get more and more crowded with each move that you make. Do your best to keep up with all the cupcakes as they accumulate! Can you use all of these shapes covered in random letters to form words in this challenging puzzle game? You’ll need to put them into the the right spots in each tricky level. How many words can you form while using these letters? Try to beat the clock while you give your vocabulary a real workout in this challenging puzzle game. What’s cookin’ in this kitchen? It’s time to find out in this challenging word game while you put your vocabulary and spelling skills to the test. Take a look at all of the letters in the frying pan and see if you can form them into some truly tasty words. Will you go home with a million virtual dollars or jack squat after you play this exciting quiz game? Carefully answer each question. If you get stuck, you can phone a friend or remove half of the answers from the board. This owl really gives a hoot and he’s eager to help you improve your skills at solving word puzzles. Can you find all of the words that are hidden within each one of his clever puzzles in this online game? Can you piece together the missing words from this jumble of seemingly random letters? Carefully look at the empty slots at the top of the board in each level and do your best to fill in all of them. Lots of challenging puzzles are waiting for you in this online word search game. You’ll just need to decide which category to try out first. You can go looking for different types of fruit, animals, and more. It’s hack or be hacked in this chaotic io game. You’ll be playing as a hacker while you try to infiltrate your opponents’ systems. Fetch upgrades off the Black Market while you fight to prevent your own system from crashing. Get drawn into this multiplayer online game. Artists from around the world are painting a series of images. Can you guess what they’re creating? You can also host your own room and see if your friends can correctly determine what you’re drawing. Show off your art skills with this multiplayer online game. Can you figure out what the other players are drawing? Will they be able to identify your own artistic creations? It’s time to find out. Can you figure out the names of all of the people on this stage? Take a look at the letters on the board and choose wisely. Every mistake you make will cost you valuable time in this multiplayer word puzzle game. The classic game comes to life in this online version. Can you guess each word before the drawing of the hanging man is completed? Can you find the correct spots for all of these blocks in this challenging word and puzzle game? Take a look at the letters and see if you can make them all fit into the grids in each level. Dig into this delicious version of the beloved board game. How quickly can you match up all of the yummy burgers, fries and other types of food on the playing tiles? There’s tons of free online games out there but have you been looking for one that will definitely give your brain a workout? If so, look no further than MahJongCon. Whether you spell it “mahjong” or “mahjongg,” this classic Chinese board game has been challenging players for decades. In MahJongCon, you can enjoy colorful graphics and a cool soundtrack that mixes traditional music with contemporary flourishes. You might even find yourself tapping your toes while you race to match up all of the symbols on the tiles! You’ll need to move fast, of course. A bar at the bottom of the screen below the mahjong board will keep track of your time. You won’t have much of it to spare, especially once you reach the more complicated levels. There’s a dozen of them in MahJongCon, each with an increasingly tricky series of tiles. Don’t get too worried though. If you get stuck, you can always press the hint button for some friendly advice that will help you keep moving forward. Will you successfully match up all of the tiles before you run out of time? There’s only one way to find out and that’s by clicking the play button! Check out this sugary sweet version of Mahjong. Take a look at all of the candy on the tiles. Can you match them together before time runs out in this online game? You might need a miracle in order to make it to the final level of this challenging online version of the classic board game. Team up with this wise panda while you race to match up all the tiles before you run out of time. All of these beautiful butterflies are mixed up! Step inside their virtual world and piece them back together again in this challenging puzzle game. Can you master each one of the challenges in this online version of the classic board game? There’s over four dozen of them. Choose a difficulty level and start matching up the tiles as quickly as you can. The classic board game enters a new dimension of fun in this online game. Can you match up all of the designs on each one of the cubes instead of with more traditional tiles? This magical frog has created a series of fun and challenging Mahjong boards for you to try out. Can you match up all of the tiles while you relax in his charming village hidden deep within this forest? Try out this online version of the classic board game. Take a hard look at the tiles and see if you can match them up and remove them from the board. It’s time to give your mahjong skills a workout. Do your best to match up all of the tiles while you play through this challenging version of the classic board game from China. Do you like Mahjoing? If so, hundreds of challenging levels and dozens of different boards are waiting for you in this jumbo-sized version of the classic game. Match up the tiles as fast as you can and find out if you can beat the clock. Mahjong mania continues...with a tricky, time-bending twist. HELP! Snail Bob is in a hot spot—the desert. You gotta get him out! Bob the snail is visiting the monuments of Egypt. Could you help him get back home? Snail Bob's come out of his shell, but his path to true love is paved with peril. Get your space suit on and join Snail Bob on a quest to save the planet once again. Join the adventurous mission through space with inverted gravity to help our slow slug cross the barriers. Collect all three hidden stars in each level. Ready to snail away? Try to pop as many balloons as possible using the darts you are given on each level. This young girl is going on an exciting journey through a land filled with tons of jewels. She doesn’t want to collect them, though. She’d rather watch them pop! Can you help her out in this weird and wild match 3 puzzle game? Play it here first: when Bloons invade, it’s time to go bananas! Destroy all the balloons in this explosive air defense game! Can you keep up with all of these colorful bubbles? Try to burst them as fast as you can in this electrifying bubble shooter game. They’re really piling up! Send the zombies on their final journey with the deadliest of weapons: balloons! This little fly is trying to get his balloon home in one piece. Unfortunately, it’s wrapped around what could be an endless string of barbed wire! Can you help him protect his balloon in this action game? All these cute balloons want to do is float around. Unfortunately, they’re trapped under some heavy blocks. Can you get rid of them so they can go free in this delightful puzzle game? Here comes the rain again! Return to this candy-filled kingdom for another round of exciting challenges in this match 3 puzzle game. Eliminate all the sweets from the board while you collect coins and helpful boosters. Play against a friend or challenge another gamer in this online version of the classic game. There’s tons of players from all around the world who are waiting to take you on! Make discs disappear by having their number match the size of their row or column. Can you complete all of the challenging goals in each one of the levels in this match 3 puzzle game? Link together the glittering gems as quickly as you can. Can you link together all of the boxes that make up the chains in each one of these challenging levels? You’ll need to carefully look at the numbers to make sure that you arrange them in the correct order in this intriguing puzzle game. All of these pipes within this old building in the Big Apple are really mixed up! Travel to this virtual version of New York City, as fast as you can, in this online puzzle game. Can you connect them in the correct order while you play through each challenging level? The water’s going to be turned on any second now so you’ll need to work fast! Can you squeeze all of these shapes into the grid in this fun and challenging puzzle game? There’s several different modes that you can try. Find out what happens when the timer on the bombs count down to zero in one mode that’s downright explosive! Running an airport is serious business. It’s also seriously fun! You can build, craft, and customize an entire world in this online game. Let your imagination be your guide while you try all of the different tools, landscapes, and other features. Enter a 3D world filled with wonder in this online game. You can build it, customize it, and really make it your own! Let your imagination soar! Your ship has sunk and you’re lost at sea but that doesn’t mean that you can’t enjoy yourself. Team up with another survivor to construct a palatial life raft in this simulation game. You can set up a campfire, build a fishing hole and even plant trees that will give you yummy lemons! How many moves will you need to make to fit all of these shapes into the boxes? See if you can find the right spots for them in the challenging levels in this puzzle game. You can really cut loose in this crazy 3D io game. Take control of a brave cube and battle players from all over the planet while you explore a world filled with wild landscapes and weird creatures. How quickly can you eliminate all of these colorful bricks? You’ll need to put them into groups of three or more in this challenging match 3 puzzle game. Will you earn a high score while you play this challenging matching game? Carefully inspect all of the chips on the table and see if you can connect them in the correct order. Go on a magical journey as you blast away at these colorful bubbles. Prepare to test your aiming skills in this brand new and totally fun shooter game, Bubble Shooter Saga 2! How long can you keep up with the rapidly assembling blocks in this match 3 puzzle game? Link them together into groups of three or more to eliminate them before they reach the top of the screen. Can you put the pins in the correct spots in this fast-paced puzzle game? Hit the right targets while you avoid the other pins and match up the colors. An evil wizard has trapped all of these poor bunnies in some enchanted cards. Join the Bunny King while he rescues each and every one of them in this online game. How much of the space can you fill up on this playing board? Take each one of the shapes and find a strategic place to put them in this challenging version of the classic game Tetris. You can celebrate all the thrills of the World Cup tournament in this bubble shooter game. Take control of the cannon and see how fast you can eliminate the bubbles from the field. Bend it like Beckham and kick your way to victory! Check out this cool spin on classic bubble shooter games. Join this soccer star while he matches up all of the colored balls and attempts to eliminate them. Can you keep up with all of these bubbles? They’re falling pretty quickly. Do your best to match them up and make them pop in this thrilling bubble shooter game. These bubbles are tumbling towards the bottom of the screen and they’re moving fast! Can you pop all of them before it’s too late in this extremely exciting bubble shooter game? There's only one thing better than bubbles, and that's jewels and bubbles. Bubble Shooter gets a whole new spin! This brave treasure hunter is trying to get back home with his latest big discovery. Unfortunately, tons of rampaging critters are determined to stop him in this bubble shooter game. Can you help him fight back before it’s too late? The bubbles in this unique and challenging bubble shooter game are really starting to pile up! To make them go away, you’ll need to link together their numbers until they add up to five. Can you do it before they reach the bottom of the screen? Step into this cemetery and get ready to bust some ghosts and burst some bubbles! Take control of this cannon and fight an army of pesky poltergeists in this puzzle game. Match the bubbles with the right color. Try to clean the field and go to the next level. Can you match up all of the mysterious bubbles in this devilishly delightful bubble shooter game? Take control of the magical cauldron and connect them as fast as you can. A magical kingdom awaits you in this enchanting puzzle game. Can you destroy all of your mystical marbles before your enemy eliminates theirs? You’ll be up against some truly fearsome foes that are quite crafty! As a little bubble, your goal is to grow and take on the big bubbles! All of these adorable bunnies and other animals are trapped in magical bubbles! Can you bust them loose? Use the cannon to help them escape in this cute bubble shooter game. This bouncing cube is beginning a thrilling adventure through nine different worlds and tons of exciting levels. Can you keep him safe in this adorable action game? You’ll have to make him jump over the spikes and other dangerous objects at just the right moments. These blocks are all sorts of different colors. Can you make them correctly match up in this intriguing puzzle game? Just be careful. Certain blocks can only be used a few times. This brave ninja is taking on his most exciting mission yet. Can you keep him safe while he runs across an ever-changing mountaintop? He can collect sushi and other yummy treats to keep himself going in this intense mobile game. You can play against a friend or a virtual bear named Bob in this 3D air hockey game. Can you get the puck past them enough times in order to win? Bob is pretty competitive so you’ll need to stay on your toes and/or claws if you decide to challenge him. You’ll have a blast while playing this puzzle game! Destroy all the colorful blocks as quickly as you can. If you get stuck, you can always break out a bomb or another type of explosive. How fast can you solve each one of the tricky puzzles in this 3D online game? Fill in all of the cubes on each board and do your best not to get stuck. Return to the weird world of Rusty Lake for another strange adventure. What could be waiting for you within this dark cave? Join this mysterious gentleman as you explore its various nooks and crannies in this exciting point and click game. The 3D combination puzzle that was super popular in the ‘80s is back in action! How quickly can you get all of its colored cubes to match up in this challenging online game? Uncover the truth of your past in this point and click mystery game, Cube Escape: Birthday. Find the clues and then put them together in order to solve the mystery. The Spirits of the Kelley Family is trapped in this old abandoned house! Collect the clues, pages and search for the missing secret stones to free these trapped souls and solve the mystery in a point-and-click puzzle adventure. How will your luck stack up in this online version of the classic card game? Do your best to match up the numbered cards while you compete against the computer or other players online. This greedy monarch needs to be taught a lesson or two. It’s time to raid the royal treasury! Choose a suitcase and find out if you’re about to win a virtual fortune. Can you recreate all of the designs that are waiting for you in this tricky puzzle game? Carefully look at each one before you start moving around the pegs on the board in all of the challenging levels. Can you beat all of the word challenges that you’ll find in every level of this cool puzzle game? Link up the letters in each neon cell to form words as quickly as you can. The clock is ticking and you don’t have much time. How fast can you find all of the hidden words in these puzzles? You’ll definitely need to move quickly in this challenging online game! This witch is going on an adventure through a spooky kingdom that’s filled with lots of incredibly fun crosswords. Can you help her answer each question in this enchanting word game? She could really use your help while she continues her journey on her magical broomstick. Can you fill all of the empty squares in this tricky online game? See if you can figure out the missing words with the letters that are available in each one of the challenging levels. This pencil is pretty clever and sneaky when it comes to word games. Can you figure out all the hidden ones in the challenging levels in this puzzle game? Will you be able to beat all of your opponents in this cute and cool match 3 puzzle game? Connect the colorful items as fast as you can while you keep an eye out for special ones like carrots. They'll help you earn extra points. Deep within this jungle, there’s a temple filled with precious jewels. Can you link them all together in this match 3 puzzle game? Team up with this magical monkey while you collect boosters that will help you during your journey. How many pieces of delicious candy can you put together before the clock runs down to zero? You’ll have to play as fast as you can in this match 3 puzzle game. Julia’s exploring a kingdom filled with candy in this delightful match 3 puzzle game. Can you help her connect all of the delicious sweets? She’s determined to earn lots of points in each challenging level. This little bear has an incredibly big tummy. He also has quite the sweet tooth! Can you help him eat all of his favorite types of sweets in this match 3 puzzle game? He’ll definitely let you know which ones he’s craving. Will you get a high score in this thrilling match 3 puzzle game? Connect all of the delicious candy as quickly as you can while you explore an enchanted kingdom filled with yummy treats. You can play against a friend or the computer in this online version of the classic game. But will you get four in a row? It’s time to find out! This orchard is filled with tons of fruit! Can you group all the different types together in this match 3 puzzle game? If you get stuck, there’s all sorts of crazy power-ups that will help you out. Try blasting them with the ray gun! Defend your fruit in this fun and addictive strategy game on your browser, Fruit Defense 4! You’ll have a most challenging time, indeed! There’s lots of berries waiting for you in the forest behind this majestic farm. They’re all mixed up, though. Can you put them all together again in this match 3 puzzle game? You can try out different designs on the tiles in this online version of Mahjong, the classic board game. There’s several different challenging modes as well. Can you beat the hard one? What about the even tougher inferno board? Slice and dice your way through this endless batch of fruit. Use your samurai sword to destroy coconuts, watermelons and more while you avoid the bombs in this action game. All of this fruit is really stacking up. Clear out as much of it as possible before it’s too late. How quickly can you link together all of these party supplies? Feel the groove while you give your match 3 puzzle skills a workout in this online game. Oh no! Another army of genetically-modified veggies has escaped from the lab. Now it’s up to this tomato to smoosh them in this action-packed puzzle game. Could you lend him a hand? Or maybe, in this case, a stem? It should come as no big surprise that this apple would rather not get eaten. Can you help him escape from the kitchen in this physics-based puzzle game? If he can reach the portals in each level, he’ll be safe.